Big profit soup! 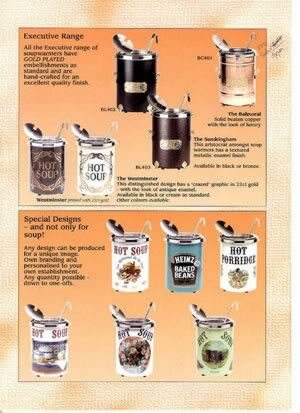 Put you portable SOUPERCAN on display and THE SOUP SELLS ITSELF !! The SOUPERCAN is unique! It is covered in vitreous enamel. NON-FADE! – EASY TO CLEAN! - CUSTOMER APPEAL!! Put one of these babies on the front of your counter and watch the requests come in. Ideal for Café’s - Burger Bars - Fish and Chip shops - Mobile Units – Clubs - Canteens etc etc. can be leased for as little as 80p per day. (Minimum rental period – 12mths) Contact us for further details.